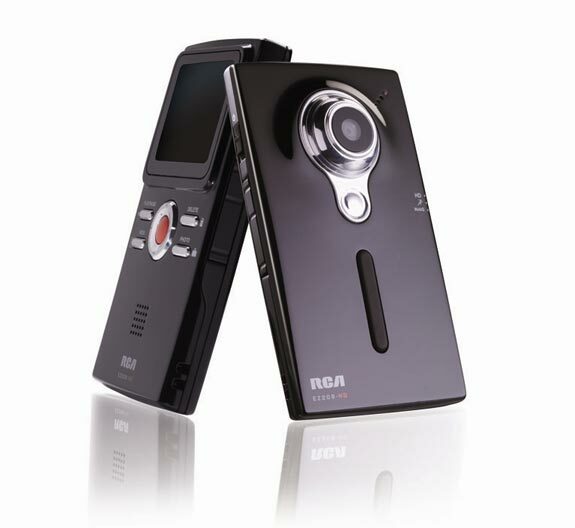 RCA has launched a new HD camcorder, the RCA Small Wonder HD Camcorder, which can record video at a 1,280 x 720 (H.264), it measures just 0.5 inches thick and comes with 256MB of built in memory. It features an SDHC card slot, and HDMI out so you can hook it up to your LCD or Plasma TV, check out the full specifications below. HD Recording – Video Resolution: 1280 x 720 in H.264 format. Slim Design – At roughly a half of an inch thick, the EZ209HD is the perfect size for your pocket. Point-And-Shoot Simplicity – Small and portable, just aim and press RECORD. Resolution Modes – Record up to 8 hours in HD mode, up to 8 hours in Sports mode, or up to 40 hours in Web Quality1 (with an optional 16GB memory card2. Internal Memory – 256MB of internal memory. Built-in Simple Software – Camcorder comes complete with integrated Memory Manager™ software that allows you to download video through high-speed USB connection to email or share video clips with family and friends. Activates automatically when camcorder is connected. View Your Videos – View on PC or Mac3. Direct YouTube™ Uploading – Quickly and easily upload videos directly to YouTube™ with Memory Manager™. Display – 2” LCD Display. Easy TV Viewing – Watch your video clips on TV by connecting the camcorder using the included AV cable. HDMI Connection – Connect to your HD TV using the built-in HDMI connection. Still Photo Capture – Capture 8 megapixel4 still photos using the dedicated photo button. Built-in Rechargeable Battery – Adapter included. Accessory Kit Includes – AV Cable, Wrist Strap, USB Cable, and Battery Charging Adapter. The RCA Small Wonder HD Camcorder will go on sale for less than $100.